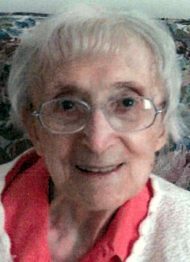 Margaret A. Danko, 101, of Lititz, formerly of Bethlehem, passed away on Monday, April 1, 2019 at Brethren Village. Born in Phoenixville, PA she was the daughter of the late Mary (Bdzoch) and John Danko. Margaret was a member of the St. John Neumann Parish in Lancaster. She was formerly a member of St. Cyril and Methodius Catholic Church in Bethlehem, PA. She was active in the Slovak Catholic Sokols and the Jednota Society. Margaret started her career as a bookkeeper at Woolworths and McCrory’s Five and Dime before retiring from Bethlehem Cut Rate Meat Market as a bookkeeper. She enjoyed word puzzles and playing Scrabble. She was talented at crocheting and loved flowers. Most of all Margaret cherished spending time with her family. Margaret is survived by her niece and caregiver, Lori Sugra and her husband Bob; and many nieces, nephews, great-nieces and great-nephews. She was preceded in death by her sister, Mary Stofko; and her brothers: John and Joseph Danko. A viewing will be held from 10-11 AM with A Mass of Christian Burial celebrated by Rev. Steven Arena to begin at 11 AM on Monday, April 8, 2019 at St. John Neumann Catholic Church, 601 E. Delp Road, Lancaster, PA 17601. Margaret will be laid to rest at 10 AM on Tuesday, April 9, 2019 at St. Cyril and Methodius Cemetery. In lieu of flowers, donations may be made in Margaret’s memory to the Benevolent Fund at Brethren Village, 3001 Lititz Pike, Lititz, PA 17543. I am a parishioner at SJ Neumann and take communion to many Catholics at Brethren Village. Margaret was such a sweet woman. I have been taking her communion and she was always so appreciative. After Communion we would both offer prayers and say the Our Father together. I loved my visits with her and she was always in my prayers. My name is Meg Connors real name Margaret…..she liked that!! Margaret was my Godmother as well as a beloved extended member of the family. She was such a sweet woman who enjoyed visiting with our family and sharing special moments such as Birthdays, Communions and other special occasions. She shared her knowledge of the family history and would show me photos and tell me stories. She even offered to teach me Slovak. I know she is at peace because she was a kind and devout woman.